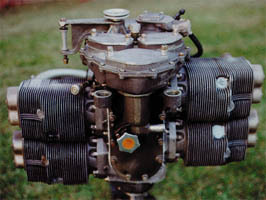 The Franklin / PZL 4A-235-B3 aircraft engine was developed to be a higher power replacement for the Continental A-65 through 0-200 engine line. As a result, the Franklin engine will fit directly to an 0-200 engine mount, the exhaust system and carburetor mounts in nearly the same location and the cowling will usually still fit. The 4A-235 weighs within a few pounds of an 0-200 when the engine are comparably equipped, yet it is rated at 125 HP. Engine Weight (Dry - Without Accessories) 206 lbs. Wet Slump - Oil Capacity 6.6 Qts. Check out these benefits of the 125 hp Franklin engine ! 254 lb-ft torque at 2800 rpm! These are NEW FAA-certified aircraft engines, not a rebuild of a high time engine that has been subjected to years of unknown treatment. Because these engines are used in helicopters (6-cylinder model), where they are turned at 3200 RPM, they are under stressed in fixed-wing aircraft where they are operated at 2800 RPM. The cylinders, bearings, valves, lifters, connecting rods, etc., are common throughout the engine line production, reducing cost and parts inventory problems. The cylinders have removable sleeves (cost only about $80 each!) that are field replaceable, the camshaft is on the bottom of the engine, and the oil pump is in the sump, so there is less chance of losing its prime and the resulting dry starts, especially in cold weather. There is a removable top cover on the crankcase so that the inside of the engine can be easily inspected. The exhaust ports have insulating sleeves to reduce cooling requirements and simplify installation of exhaust manifolds. Further, the engine can be easily adapted for inverted oil systems. All Franklin / PZL engines have built in fluid damper on the crankshaft which makes then the smoothest aircraft engines of their size.